I still think of Sympetrum vicinum as the Yellow-Legged Meadowhawk, because that's what it was called in the first dragonfly field guide I ever owned. In 2004 the Common Names Committee of the Dragonfly Society of the Americas decided the old name was too confusing, because as vicinum matures it changes from yellow to red, and the legs become reddish brown. The whole idea of having a committee that establishes official common names seems bizarre to me, but since most of these names were made up by the DSA in the first place and are no older than 1978 -- and since the old name really is kind of confusing -- I go along with it when I remember. The new name reflects the fact that Sympetrum vicinum is an unusually cold-tolerant species. In Minnesota, if we don't get a hard frost, they can still be flying in November. It's very possible to see them perching near autumn leaves. 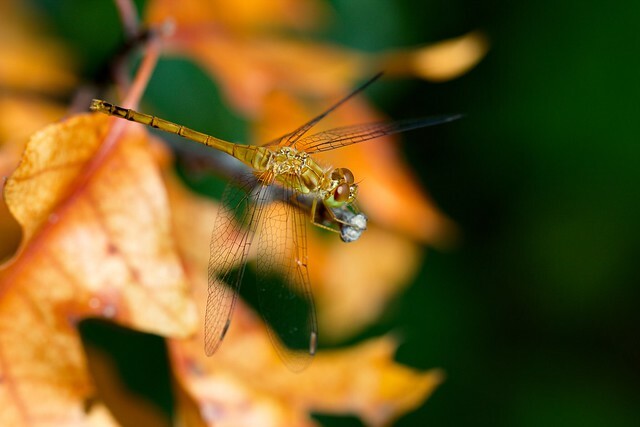 But by the time the leaves have changed colors, so has the Autumn Meadowhawk -- it should be red, not bright yellow. Actually I took these photos in July and the leaves in the background are just dying. Last July I took a drive through McLeod and Meeker counties, just west of the Twin Cities metro area, to look for dragonflies and damselflies. I chose the route after finding out from the Odonatacentral website that these counties' species lists were almost empty -- eight dragonfly records between them, and no damselflies at all. That's not so unusual for Minnesota. It's hard to understand: this state has tons of fresh water for odonates to breed in, and it should be an interesting place to study them because it's a crossroads -- lots of species' western, eastern, southern, or northern borders pass somewhere through the state. Yet for some reason we're way behind on filling out our county lists. On the range maps for some damselfly species, Minnesota looks like a hole -- as if they heard a bridge fell down and they're afraid to come here. So sometimes, instead of hiking in areas that are relatively well-studied, I drive around and look for new species in counties where, apparently, nobody has been paying much attention. There aren't always parks, but there are boat docks everywhere. I think those are aphids clustered upside-down on the stem. 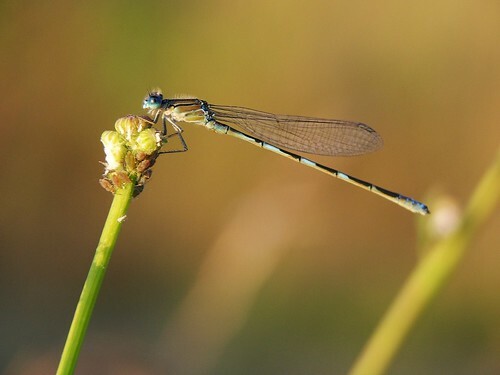 The large insect is a bluet, a very common kind of damselfly throughout the U.S. Most species are sky-blue and black, in a banded pattern that always reminds me of resistors. These are the sparrows of damselflies -- there are a lot of species that are very hard to tell apart. Most females can only be identified with a microscope. Males are a little easier: if you look at their abdomens from above, some of them are mostly black, and those species can, in theory, be identified through binoculars. Others are mostly blue, and can only be identified by examining the cerci at the end of the abdomen. This one is just about half-and-half on the middle segments, which means it's probably a Tule Bluet. But what really interests me about this damselfly is that the blue bits aren't all blue. Young adult bluets are brown -- usually a pale brown with a drop of purple in it; the warmer tone here is probably produced by the sunset light. This one is just getting his adult coloration, and it's coming in in patches. I think it looks like turquoise in matrix -- as if the brown is being gradually polished away.